4 Guantanamo Detainees Transferred To Oman, 1 To Estonia : The Two-Way The transfers, announced late Wednesday, bring to 122 the number of detainees who remain at Guantanamo Bay. The move comes amid GOP opposition, citing security, to freeing prisoners from the facility. 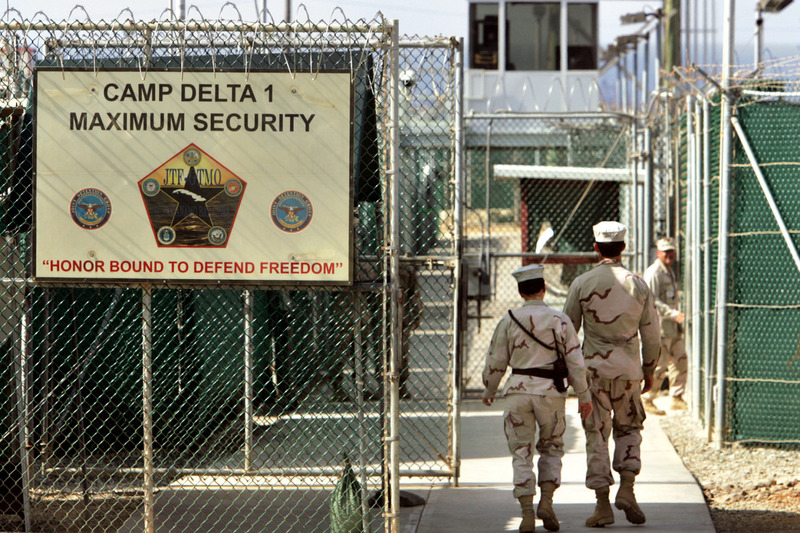 In this June 27, 2006, file photo U.S. military guards walk within Camp Delta at the Guantanamo Bay U.S. Naval Base, Cuba. The U.S. announced the transfer of four detainees from Guantanamo to Oman; one will go to Estonia. The U.S. has transferred five detainees from Guantanamo Bay — four to Oman and one to Estonia, the Defense Department says. The transfers bring to 122 the number of detainees who remain at the military prison. The detainees sent to Oman are Al Khadr Abdallah Muhammad Al Yafi, Fadel Hussein Saleh Hentif, Abd Al-Rahman Abdullah Au Shabati and Mohammed Ahmed Salam; the lone detainee moved to Estonia is Akhmed Abdul Qadir. All of the men are Yemeni. The transfers were announced late Wednesday and follow a review of the detainees' cases by the interagency Guantanamo Review Task Force. "As a result of that review, which examined a number of factors, including security issues, [they were] ... approved for transfer by the six departments and agencies comprising the task force," the statements said, adding Congress was informed of the transfers. "All five freed detainees got to Guantánamo in the prison camps' early days. None was ever charged with a crime and all had been cleared for transfer for years. But, as Yemenis, they could not go home because U.S. officials feared they would be lured to al-Qaida in the Arabian Peninsula, the terror group that Wednesday claimed responsibility for last week's attack on the French satire newspaper Charlie Hebdo." Indeed, the Paris attacks may have complicated President Obama's desire to close the prison — a desire he expressed while still a presidential candidate. This week, congressional Republicans said the Paris attacks showed that "now is not the time to be emptying Guantanamo." GOP senators introduced legislation this week that would, according to The Associated Press, "bar transfers to Yemen for two years, suspend the transfer of high- or medium-risk terror suspects for the same period and repeal current law that has allowed the administration to transfer prisoners to foreign countries and reduce the population at Guantanamo. The bill would prohibit transfers of terror suspects to foreign countries if there has been a confirmed case where an individual was transferred from Guantanamo and engaged in any terrorist activity." The lawmakers say the recidivism rate for freed detainees who have re-entered the battlefield is as high as 30 percent. But a State Department official disputed those figures. A September 2014 report from the Office of the Director of National Intelligence on recidivism by freed Guantanamo detainees found that before 2009 detainees "confirmed of re-engaging" was 19 percent while detainees "suspected of re-engaging" was 14.3 percent. After 2009, the report found, detainees "confirmed of re-engaging" was 6.8 percent while detainees "suspected of re-engaging" was 1.1 percent. As we have been reporting, there have been several detainees released from the naval detention center. Prisoners have been transferred to Kazakhstan, Afghanistan, Uruguay, Georgia and Slovakia. The facility, which held 680 prisoners in 2003, holds detainees captured in the war on terrorism that followed the attacks of Sept. 11, 2001.